Our projects including our blue carbon work, habitat mapping and restoration work are cutting edge and of local, national and international significance. We help grow and maintain blue-green infrastructure for present and future generations. These natural assets, unlike built/grey infrastructure, gain value over time. And if you shop at Quality Foods , you can also easily assign your points to Project Watershed at the till. Your contribution is greatly appreciated and will make a difference! We value your satisfaction and security at Project Watershed. Personal information you provide to us is used exclusively to process your donations, and to maintain a record of contributions. We may also contact you about programs and events. If at any time you no longer wish to be contacted, please send us an email at projectwatershed@gmail.com or call (250) 703-2871. Make a one time donation to Project Watershed today – you can do it online, by mail or in person. For donations over $25 you will receive a tax receipt. *You can turn any donation in to a monthly donation using the “Donate” Paypal buttons on this page. Click the yellow DONATE button if you wish to make a contribution. Your donation will be made through Paypal via credit card or your Paypal account (please note: you do not need a Paypal account to use your credit card on Paypal). You can send a cheque made out Comox Valley Project Watershed Society to 2356a Rosewall Crescent, Courtenay, BC, V9N 8R9. Include the name of the art work you have chosen if applicable. Drop by our office with a cheque or cash at 2356a Rosewall Crescent in Tintown Courtenay. Major contributions of $1000 or more enables you to choose a limited edition print on canvas (prints vary in size but are larger than the paper prints). To set up monthly donations please print and sign this form MONTHLY DONATION FORM. The form can then be sent or dropped off at Comox Valley Project Watershed Society 2356a Rosewall Crescent in Tintown Courtenay, BC, V9N 8R9. Or set up a monthly donation through Paypal using the donate button (please note: you do not need a Paypal account to you can use a debit card or credit card on Paypal). Business sponsorship starts at $150. When you make a financial contribution to Project Watershed of $150 or more you get to choose artwork from our Keeping It Living Collection (you can choose to recieve the artwork as a print or a commemorative plaque) as a token of our gratitude. Major contributions of $1000 or more enables you to choose a limited edition print on canvas or either of the previous options. In addition to the limited edition prints Business Sponsorship also include public recognition via a press release, placement of logo and link on our website and mention at appropriate events. You can make you contribution and chose your artwork by clicking the button or by visiting our office at 2356a Rosewall Crescent in Tintown, Courtenay. You can easily donate some of your investment shares through Canada Helps to Project Watershed and we will receive the cash value to complete our projects. To get a tax receipt for this you need to complete the process by mid December. 1. Type in Comox Valley Project Watershed Society besides the search button and click “Search” then click the maroon “Add Charity” button in the pop up. 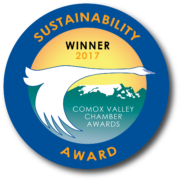 Click the “Continue” button once Comox Valley Project Watershed Society is listed under Charity Name. 2. Answer a few basic questions on the next page regarding the securities you’d like to donate and how to contact your financial advisor and investment firm. 3.Complete the provided Letter of Direction form and send it to your financial advisor or investment firm. This authorizes your advisor to transfer the shares to CanadaHelps. A legacy is one way a person or persons are remembered. A legacy – large or small – to Project Watershed can be a part of that, showing a special commitment to the ongoing work of restoring and sustaining Comox Valley watersheds and the K’omoks Estuary for future generations. You don’t have to be wealthy to create a legacy. Creating it requires some planning, but it’s probably easier than you think. Most legacies are done through a will. Some would name the Comox Valley Project Watershed Society as a beneficiary on an RRSP or other registered fund, some on a life insurance policy, or a trust. The Robin & Jennifer Harrison Environmental Fund has been set up at the Comox Valley Community Foundation for Project Watershed. We will receive yearly interest from this fund and it is a good way to ensure we have funds in perpetuity. Contact the Comox Valley Community Foundation to donate to this fund. For these and other ways to make a legacy gift to Project Watershed FIND OUT MORE . Join our mailing list to receive the latest news and updates from Project Watershed.